Welcome to Muzicalia Galaxy, where, when the aliens that live there become obsessed with Earth’s sports, they attempt to recreate them with their own rhythmical rules. Excited to test them out, they call on Earth’s finest, such as sports master Lil Slugger, to compete in a music-infused pentathlon. And so, you step up to show the sports-loving extraterrestrials how it’s done in Super Beat Sports. Slickly presented with bold and colourful charm, this Nintendo Switch exclusive collection has five sports-themed mini-games that challenge your rhythmic reflexes. It will be easy for players to see that each mini-game – whether that be Whacky Bat, Net Ball, Gobble Golf, Buddy Ball, or Rhythm Racket – is clearly rooted in some of the most popular sports on our planet, but the musical twist that the Muzicalian aliens have wracked their brains to produce sees the experience tread into the unexpected. 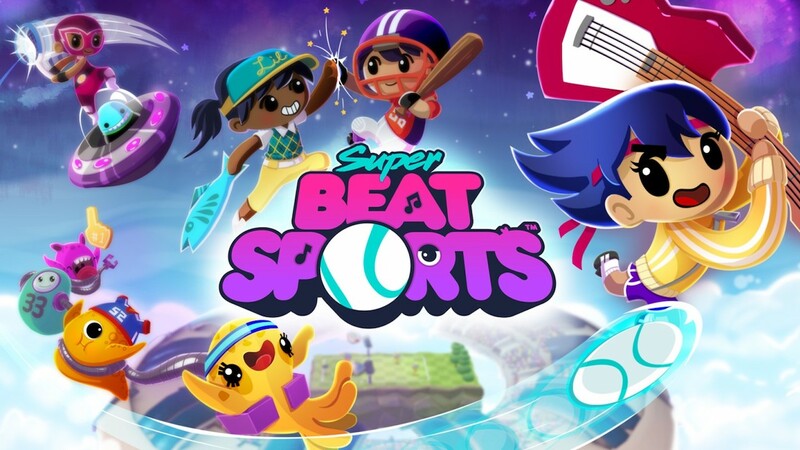 Given the unrivalled skill and pedigree that developer Harmonix has in the genre, it won’t come as a particular surprise that Super Beat Sports has been executed with rhythmic precision. The five sports-themed mini-games can be played solo or with friends, and, as always, the more players that are thrown into the competition, the more entertaining it becomes. Whacky Bat sees players move between lanes as Nibbzes pitch balls at them, with your goal being to land a perfectly timed slug to see them soar back in their direction and land in their mouths. It’s as simple as pressing the A button to hit the ball, using the Left Stick to move between lanes, or hitting the L or R button to dash across two lanes at once. When a second player joins in, Whacky Bat adds red Nibbzes and blue Nibbzes to take into consideration. These hurl red and blue balls at you, with each player being required to only hit those that match their colour – the resulting laughter largely stemming from slamming your bat into the wrong ball. Net Ball is all about sonic serves and smashing spikes, with players volleying their way to victory as Squibzes try to distract you. The A button will see you swing your bat to hit the ball, and, once again, you will want to time your button press with the music to maximise your score. Making the action all the more exciting is that, at times, the player will need to spike the ball – leaping into the air and listening to the crowd’s countdown to cue their timing before slamming it back toward your opponents to score a point for your team. Maintaining a successful hit streak remains key to boosting your score, and, when you team up with a second player, Wubwub joins the other team to make it three-versus-two and, again, there are colour cues for red and blue balls to help players spot when it’s their turn to swing their bat. Feeding hungry Nibbz is your goal in Gobble Golf, with your score being based on how many you feed. When they open their mouths to sing, the player must take their chance to slam a ball in their direction for them to gobble down. It starts off easily enough, but when Nibbzes get together they sing in rhythmic patterns and, soon enough, you will be using the Left Stick to switch your aim between the different islands that they are on. This has a slower pace to the previous mini-games in Super Beat Sports, requiring players to watch, listen, and learn before timing their shots correctly in each round. And, while you have multiple chances to feed each of the Nibbzes until your balls run out, any that you don’t use are saved up for the Bonus Round, where you can enthusiastically sling them in the direction of an insatiably hungry Nibbz to score yourself bonus points. With a second player by your side, the ball changes colour to indicate whether the red or blue Slugger should hit it. And, to make matters worse the Nibbzes are red and blue too, and will only eat balls that match their colour. This rounds out the co-operate mini-games nicely, although we felt that Gobble Golf was the weakest out of the three. The ball-bashing Buddy Ball is the first mini-game to support up to four players and has a slightly different set up in choosing between either a one-versus-one or free-for-all mode. This continues to have a simplicity in approach and sees players use the Left Stick to aim at one of three targets and, when the ball is sailing in their direction, pressing the A button in time to slug it in their direction. There are four different Muzicalian aliens that will randomly alternate on each target platform, and, generally speaking, the smaller they are the quicker they will whack the ball back at you. In this competitive mini-game, your objective is to outlast your opponents to be the last Slugger standing, with players losing a heart whenever they miss or get hit by the ball, or if they accidentally slam it into a Bomb pickup. This is easily one of my favourite mini-games in Super Beat Sports thanks to how frantic it all is, especially when you have four players huddled around your Nintendo Switch all trying to outdo one another. What made it even more hilarious was the pickup that speeds everything up – we cried with laughter the first time that happened! Last but not least is Rhythm Racket, the fifth and final sports-themed mini-game in Super Beat Sports. This actually makes players complete a tutorial before the rest of the mode is unlocked, unlike the rest of the mini-games that teach you as you go along. This reminded me of air hockey for some reason, being another competitive mini-game where players must block the ball from their goal while trying to knock it into their opponent’s. You can choose to either bunt the ball back at your competition or whack it with your bat, which lends it more speed. You can unleash a Power Shot by firstly pressing the X button to set the ball and then hitting the A button as it lands, with the risk that you will flub it entirely if you don’t successfully whack it. Soon there are Nibbzes that you can take control of that will eat up and spit out the ball in your chosen direction, which, too, can perform a Power Shot or an Instant Spit, and it soon starts to become clear as to why Harmonix wanted to teach everyone the basics before seeing them ricocheting the ball at each other. The Saxophone power-up got some laughs, too, slowing the mood down as players race to break through barriers to secure themselves an extra heart. And with four players in on the action, this quickly descends into entrancing chaos. Stick it out and Rhythm Racket soon proves to be the most rewarding mini-game, not least for the fact that it is the most unpredictable. It’s worth mentioning that Super Beat Sports supports motion control, effort on the developer’s that shouldn’t go unnoticed. You can choose to swing the Joy-Con rather than use button presses, but, seeing as how many are required per run, I wouldn’t be surprised to hear that most choose the simpler input. There’s also Local Wireless Play for those that want to play across multiple Nintendo Switch consoles, although I wasn’t able to test it out. Longevity is always a challenge with rhythm games, but Harmonix gives it their best shot. Good performance will steadily reward you with new costumes to dress Lil Slugger in and let you swap your bat out for other swingable items such as a mallet, electric guitar, or garden gnome. Whacky Bat, Net Ball, and Gobble Golf serve up Single Player and Multiplayer levels at increasingly trickier difficulty tiers that each have different songs, while those looking for an even greater challenge can look to Pro Mode to pick up the pace. There’s certainly enough to keep you busy, but, given that there are only the five sports-themed mini-games, there is some concern that players may tire quickly – even if it’s a game that many can chip away at over time. Breathe deeply, believe in yourself, and become one with the rhythm. Super Beat Sports is packed with personality and cheerful beats, and, now unshackled from Apple TV, has found a more suitable audience to tap into on Nintendo Switch. Worthy of your time, it presents an unbeatable addition to the Nintendo eShop that, as with its setting, is quite simply out of this world.